The Cumberland & Dumfriesshire Farmers Mart P.L.C. had forward 3,688 store hoggs & 573 in lamb ewes at their weekly sale at Longtown on Tuesday 16th February 2010. Stores still in strong demand. Top was £91.50 for Beltex from Old Hall, Texels to £85.80 Redbanks, £78.50 Muirhead; Suffolks £84.80 Shawhill, £83.80 Redbanks; Greyfaces £84 Nirvana; Hill Cheviots £67.50 Kirklands; North Country Cheviots £79.50 Redbanks, £77.50 Thomas Telford; Blackfaces £53.50 Newton, £50.80 Clover Hill; Swaledales £49.50 Lowthwaite; Lleyns £59.20 Rammerscales; Herdwicks £49.20 Roosecote. Cast ewes to £85 Greenknowe, hill types to £54.20 Newton. Cast rams £87.50 Old Irvine. Inlamb ewes were again easily sold although quality not as good. Top was £152 for Mule shearlings from Taylorburn. 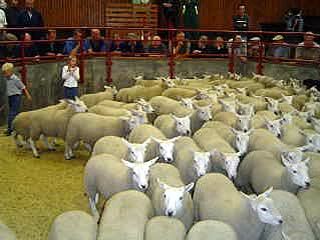 Ewes to £108 for Texels from Almagill; Greyfaces £92 Eycott; Jacobs £72 Newton; Blackfaces £70 Newton. Ewe hoggs £100 for a Beltex from Almagill.